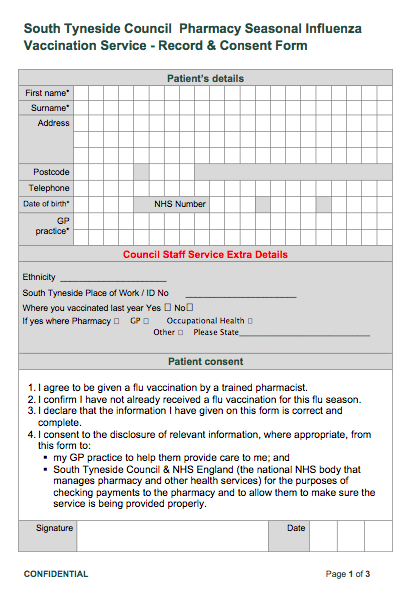 Gateshead & South Tyneside LPC is pleased to announce that we have again negotiated a new "flu vaccination" service with South Tyneside Council. The service is funded by the council and is to allow its council staff and providers of council commissioned care (including residential and domiciliary care) staff to be privately vaccinated in the pharmacy. The service will be operated through pharmoutcomes which will facilitate claims to the council. Below is a copy of the SLA. You will need to read this and send a copy of the signed signature page back to the council. This service is open to all contractors in SouthTyneside and there is an opportunity to provide offsite flu clinics. This will be co-ordinated by Louise Lydon, our secretary. ​Each Vaccination will attract a £10 fee as per the SLA. Offsite work will include £50 for a clinic lasting up to 2 hours and £200 for clinics running between 2-6 hours. 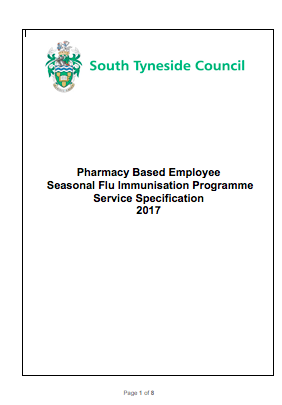 Please note that this year the pharmacy will need to have a private PGD in place in order to offer the council service. Very shortly a new service will appear on the pharmoutcomes screen. Should you choose to not participate in the service you will be expected to signpost council staff to other pharmacies who are offering the service. Eligible Council staff will be advised to present in the pharmacy with valid ID in order to get their free flu jab. Please note that the council service requires a slightly different data set to the national NHS service. We have amended the record and consent form from the NHS Service to aid you in collecting this information. This can be downloaded below. You are free to use any paperwork you wish however you will need to ensure you collect the relevant information for submission to pharmoutcomes. 2. 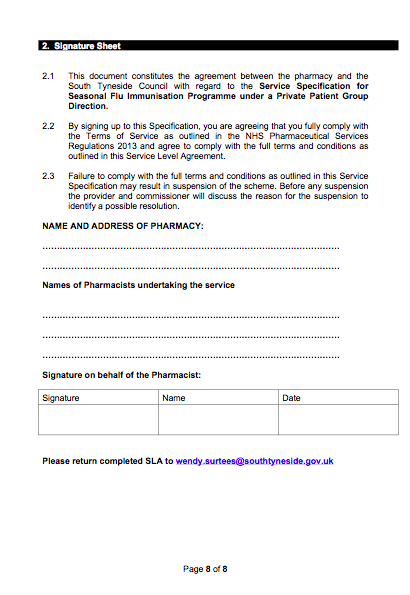 Ensure your pharmacy staff are aware that Council staff will be presenting themselves for the vaccination. 3. If a person presents with suitable identification as a member of council staff - then please vaccinate using your private PGD. 4. If the person is eligible for the NHS service offer them the NHS vaccine and process through the NHS Service. 5. If vaccinated through this scheme ensure that all the claims are made through the new service on pharmoutcomes.